Fundación Telefónica analyzes the progress of infrastructures and digital services in Spain every year. The result is the report Digital Society in Spain, which not only includes the most relevant sectoral indicators, but also takes into account the social impact of digitization. This 2017 issue talks about the scope of fixed and mobile broadband networks, which support our life on the Internet, the use we make of different digital services and the way in which these are changing our lives. There are also issues such as the digital activity of the business ecosystem and the public sector and, of course, we do not forget the most avant-garde elements of digital transformation, such as artificial intelligence, the Internet of things, autonomous cars or blockchain. 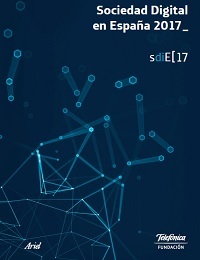 As in previous editions, the analysis integrates three large blocks of data that allow us to build a global and original vision of the digital ecosystem in Spain: external sources of recognized prestige, statistical data of the business units of Telefónica and territorial information provided directly by the Autonomous Communities.